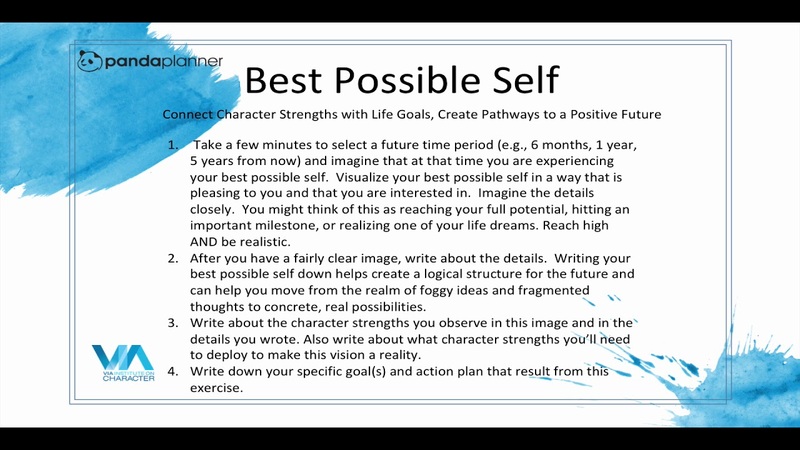 Connect character strengths with life goals and create pathways to a positive future! This exercise has been shown to boost people’s positive emotions, happiness levels, optimism, hope, coping skills and positive expectations for the future. Think about this exercise as having two basic steps: a visualization component and a character strengths component. Take a few minutes to select a future time period (e.g., 6 months, 1 year, 5 years from now) and imagine that at that time you are experiencing your best possible self. Visualize your best possible self in a way that is pleasing to you and that you are interested in. Imagine the details closely. You might think of this as reaching your full potential, hitting an important milestone, or realizing one of your life dreams. Reach high AND be realistic. After you have a fairly clear image, write about the details. Writing your best possible self down helps create a logical structure for the future and can help you move from the realm of foggy ideas and fragmented thoughts to concrete, real possibilities. Write about the character strengths you observe in this image and in the details you wrote. Also, write about what character strengths you’ll need to deploy to make this vision a reality. Write down your specific goal(s) and action plan that result from this exercise.